By John C. Toman. Posted August 30, 2012, 6:02 AM. Early morning thunderstorms doused parts of Hemet Wednesday in the second straight day of monsoonal-related activity. WeatherCurrents' station in Hemet received 0.08" in the 11am hour Wednesday. Tuesday's activity included sprinkles in the parts of Southern California's inland valleys, and a moisture plume that eventually made its way to the coast before dissipating. 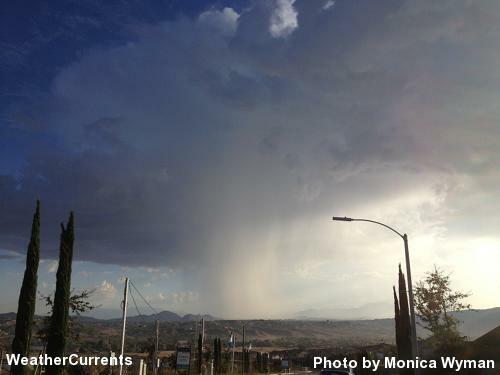 As of Thursday morning, monsoonal moisture was still streaming into the region via upper level southeasterly flow. Thunderstorms and heavy showers are predicted over the mountains and deserts, and, like the past two days, they may stray over portions of the inland valleys, especially the eastern areas. A flash flood watch has been issued by the National Weather Service for the mountains and desert areas. Friday is expected to be a less active day for thunderstorm activity. Over the weekend, some remains from Hurricane Ileana are expected to arrive. Ileana is currently weakening off the Baja California coast. Morning thunderstorm east of Temecula. Photo courtesy of Monica Wyman.